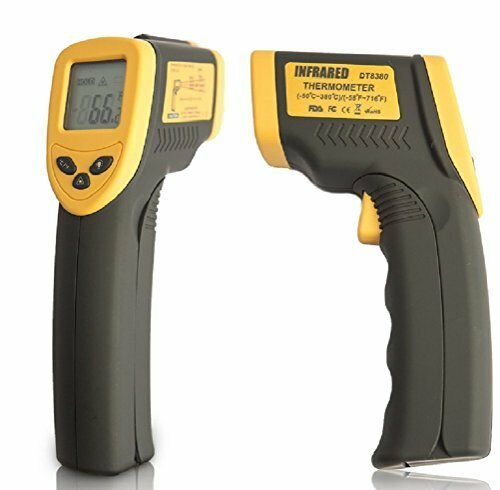 The infrared thermometer comes with a laser which accurately pinpoint the location that is being scanned. Large buttons and large readable back lit digital LCD screen makes the infrared thermometer easy to use. When the infrared thermometer is not in use, it will auto-shut off to maintain battery life. Quick Aim And Precise Measurements: ensured by laser targeting and a digital display providing superior accuracy. Perfect for cooking, medical, automotive maintenance, air leaks, while avoiding risk of burns and injury. Comfortable In Hand With Easy To Read Display: ergonomic grip and high quality materials make this thermometer feel sturdy and durable while measuring. Backlit digital LCD screen provides visually stimulating data. WE'RE REAL PEOPLE AND WE ACTUALLY CARE ABOUT YOU - Satisfaction Gurantee: If you have any problem with your product within the first year of your purchase, please contact us and we will promptly send you a new one! If you have any questions about this product by Champion Automotive, contact us by completing and submitting the form below. If you are looking for a specif part number, please include it with your message.